The igDatePicker control extends the functionality of the igDateEditor control and requires the jQuery UI Datepicker script to be included in the page (jquery.ui.datepicker.js). For more details on the igDatePicker control’s API, refer to the igDateEditor and igEditor control’s API documentation. 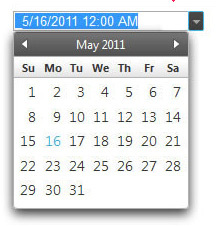 For more information on customizing the jQuery UI Datepicker, see the jQuery UI online documentation. Further information regarding the classes, options, events, methods and themes of this API are available under the associated tabs above. The following code snippet demonstrates how to initialize the igDatePicker control. Sets gets visibility of spin and drop-down button. That option can be set only on initialization. Button to open list is located on the right side of input-field (or left side if base html element has direction:rtl). Button to clear value is located on the right side of input-field (or left side if base html element has direction:rtl). Sets gets options supported by the jquery.ui.datepicker. Only options related to drop-down calendar are supported. Sets gets ability to automatically focus the input, when a calendar is opened. null - attempt to detect touch/mobile device and prevent focus in INPUT field when calendar is opened.